Allen & Heath digital iLive systems were used for the recording of a new DVD by one of Brazil’s most popular singers, Claudia Leitte. 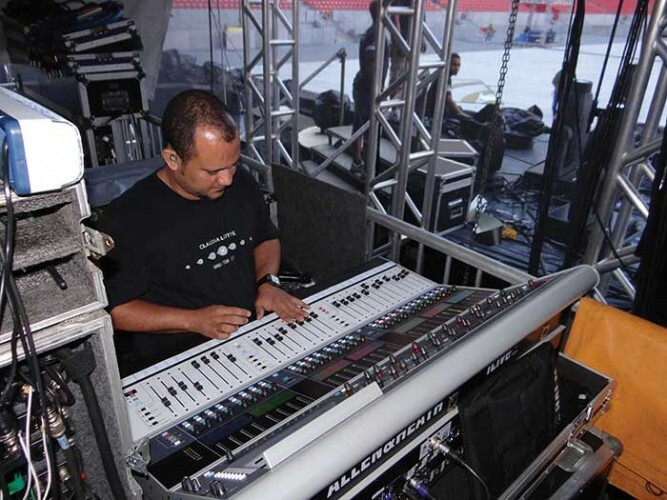 Recorded at a major gig in Pernambuco Arena in Recife, an iLive-112 Control Surface with iDR-64 MixRack was used by monitor engineer, Roque Fausto, and an iLive-144 surface with iDR-64 rack using Dante, was employed by famed engineer, Beto Neves, in the mobile recording truck. Claudia Leitte is a Brazilian axé singer and former vocalist in the group, Babado Novo. The singer is currently one of the coaches in Brazil's version of "The Voice", and this latest DVD recording entitled Axe Music, is the third DVD of her solo career. The recording took place during a concert ‘The Greatest Show In the World’, which also featured performances by other well-known Brazilian artists, Saulo Fernandes, Anitta and Wesley Safadão. For the monitor mix, the iLive system managed 58 inputs, 30 sends and 32 wireless packs (12 mics and 20 in-ear systems). Recording engineer, Beto Neves, was stationed in his state-of-the-art Mix2Go Mobile Recording Unit, which features iLive at its heart. All connections are made via military grade fibre optic cable with redundancy. The audio is recorded via two digital systems based on custom Apple i7s via MADI, which each record 64 channels. The system also has a ProTools interface that converts SSL Delta Link MADI format for PT Digilink. "Once again, the monitor and recording iLive systems displayed their exceptional quality, powerfully rich sound, amazing dynamic processors, the ease of which they can be easily reconfigured, and their incredible FX rack. The compressors are a dream!" explains monitor engineer, Roque Fausto. "For this particular show, I started with a scene from one of Claudia’s previous shows and restructured it to accommodate various inputs and outputs required for all of the guest artists and musicians involved. It was easy to do and provided no challenges." In picture: monitor engineer Roque Fausto with iLive during set up.